Description: Brahmi is a low spreading herb with upright new shoots and small, shining and fleshy leaves. 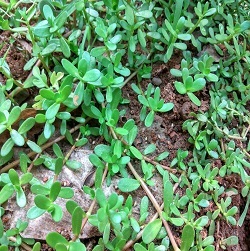 The plant bears long-stalked bluish-white flowers during late monsoon. it occurs naturally in moist places like borders of water bodies, canals and irrigated fields through out the country. How to Grow: The plant spreads quickly and it needs only a few seedlings (about five) in the beginning to fill in the allocated space. A bed size of approximately 50 x 30 cms is enough for the home herbal garden. It also comes up very nicely in shallow rectangular pots. Care regime: Brahmi is a plant of moist and marshy localities and as such requires the bed or the pot mixture to be kept moist all the time. The plant, therefore, demands watering every day. Collection: Leafy shoots can be plucked with hand from near the base or can be cut with the help of knife. As it is a fast growing plant, if maintained properly, new shoots emerge quickly and can yield adequate produce for day-to-day use. Woody branches can be used to propagate the plant further.